Knittin' Kiti gave Knit & Chat members this lovely pattern for our forums Third Anniversary. 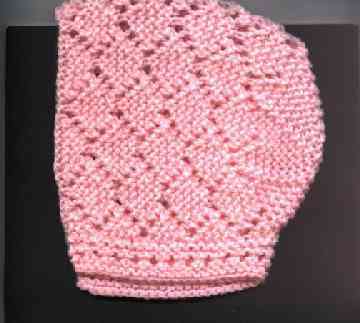 I know you will enjoy knitting this little bonnet as much as Mary and I did. There are two versions of this little beauty. First we have the bonnet with the Lace Diamond stitch pattern, and then Kiti has given us a "generic" pattern of the same bonnet in which you may use whatever stitch pattern you like. Materials: Knitting worsted weight yarn. Approx. 2 ozs. Gauge: 1 to 6 mos. - 11 sts to 2"
6 to 12 mos. - 10 sts to 2"
Row 2 - K3, *K2tog, yo, k1, yo, k2 tog, k5; rep from * to last 8 sts, k2tog, yo, k1, yo, k2tog, k3. Row 4 - K2, *k2tog, yo, k3, yo, k2tog, k3; rep from * to last 9 sts, k2tog, yo, k3, yo, k2tog, k2. Row 6 - K1, *k2tog, yo, k5, yo, k2tog, k1; rep from * to end. Row 8 - K1, *yo, k2tog, k5, k2tog, yo, k1; rep from * to end. Row 10 - K2, *yo, k2tog, k3, k2tog, yo, k3; rep from * to last 9 sts, yo, k2tog, k3, k2tog, yo, k2. Row 12 - K3 *yo, k2tog, k1, k2tog, yo, k5; rep from * to last 8 sts, yo, k2tog, k1, k2tog, yo, k3. Dec row 1 - *K8, K2tog, repeat from * to last st, K1. Dec row 3 - *K7, K2tog. Repeat across to last st, K1. Continue working the dec rows until you K2tog across the row ending with K1[6 sts left]. Cut yarn about 12" and pull through all sts, pull tight and sew crown seam. Neck Band: Pick up 45 sts, 22 on one brim side, 1st for the seam, and 22 sts for other brim side. Knit 3 rows even. Eyelet row: K1, *YO K2tog, 22 times. 45 sts. Knit 3 rows even, bind off loosely. Make a twisted cord or use a ribbon, and lace it through the eyelets. A pretty button can work just as well. *This pattern stitch is in the All-over lace patterns section, pg 50 of The Harmony Guides 450 Knitting Stitches Vol 2. Cast on 64 sts. Work 44 rows in desired pattern st.
Row 1: Knit 6 sts, K2tog, 8 times. Row 2, and every even row: knit. Row 3: Knit 5 sts, K2tog, 8 times. Row 5: Knit 4 sts, K2tog, 8 times. Row 7: Knit 3 sts, K2tog, 8 times. Row: 9 Knit 2 sts, K2tog, 8 times. Row 11: Knit 1st, K2tog, 8 times. Row 13: K2tog, 8 times. Cut yarn and pass through remaining 8 sts, pull tight. Use tail to sew up the sides of the crown. Fasten off and weave in end. Mary [Cinders47] Tweaked the Generic Baby Bonnet pattern to create this adorable Feather & Fan bonnet to show that any stitch pattern can be adapted to the Generic pattern. C.O. 62sts. K 2 rows garter stitch. Row 3: K3 [garter st. border] K1, *K2tog 3 times, [K1, YO] 6 times, k2tog 3 times*. Repeat from * to * until last 4 sts K1, K3 [garter st border]. Repeat the four pattern rows 8 times more. Row 2 and every even row: knit. Row 3:K1, *K7 K2tog, repeat from * to last st K1. Break yarn and thread through sts and pull up. 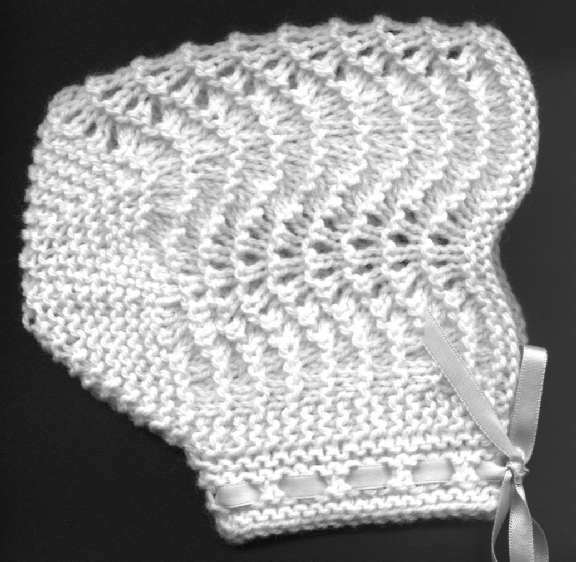 Neck band: Pick up and knit 43 sts around bottom of bonnet  21 sts either side and 1 st in centre back seam. Eyelet row: K1 *YO K2tog, repeat from * to end of row. K3 rows and cast off loosely.